Digestive Pyrotechnics: Why the chicken on cornflakes box? 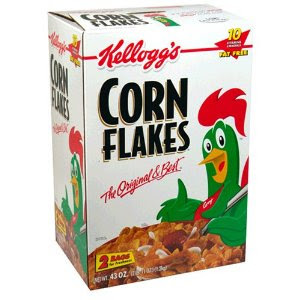 Many wonder what the picture of a chicken is doing on a box of cornflakes. Then some of the many conclude that this cornflakes has egg in it and is therefore not pure vegetarian. Then few of the some of the many start beef rumours and those few are eventually killed off. Relax vegetarians, not like Coco-Pops is made with monkey poop or Frosties made with tiger cubs. This is the Kellogg's cornflakes box. That is not a chicken, its a rooster. What do roosters do? They crow in the mornings. Mornings - meaning breakfast - meaning Kellogg's Corn Flakes. That was the idea, later they moved to different mascots for their other cereals. Another interesting story is that Mr. Kellogg, the guy who came up with this was Welsh and Kellogg sounds like a Welsh word 'Ceiliog' which means rooster and so his wife suggested to have the rooster on the box - unlikely but interesting.